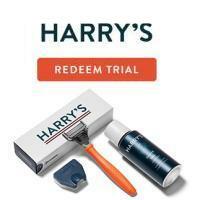 Harry's Coupon - Order your Free Trial Set of Razors and Shave Gel from Harry's. Just pay $3 for shipping. We believe that you shouldn’t have to compromise when it comes to the products you use, so ours are designed to be effective and to provide a great experience. Our team of more than 600 engineers, designers, craftsmen, and chemists make our products from the finest materials and ingredients to ensure they perform as well as they possibly can. Harry’s is a subscription service dedicated to providing their customers with a close and comfortable shave for less money! They offer high-quality razor handles and blades, as well as natural shaving gels. Before each shipment, you will get an email from them with enough time to modify or cancel your plan. You must click on this offer to get the savings.